This is it. This is the final autumn seasonal I'm reviewing in 2015. Thanksgiving was two days ago, and we now stand poised on the cusp of Christmas beer season. Before we get into that holiday's beer offerings (of which, by the way, I have six slated to drink and discuss), let's focus on the ale at hand: Dogfish Head's Punkin Ale. About a year ago, I was beginning to branch out into the world of drinking beer. I was starting to pay attention to different styles, different brewers, and the ways each brewery made a beer style their own. I had recently had Sam Adams' pumpkin beer (after having only bad pumpkin beers) and was pleasantly surprised--here was a pumpkin beer done right, one that doesn't assault the tastebuds with unbridled, grotesque sweetness. I turned to Facebook to see if my friends could recommend any further pumpkin brews. One of my friends posted this about the ale at hand: "I wish that when I turned the sink on, Dogfish Punkin Ale would come out. I wish I could breathe underwater so that I could live inside a tank filled with Dogfish Punkin Ale. I wish that Dogfish Punkin Ale ran through my veins instead of blood." Dogfish Head is, as the brewery's about page tells it, the tale of a once-little brewpub that could. What started as a modest, three keg brewpub in 1995 quickly grew into (in 1999) a brewery distributing to four states (including Delaware, Dogfish Head's home). Now the brewery's offerings can be found in half of the US. They've also got some of the best beers in the world. Punkin Ale's been around for longer than Dogfish Head. The official page for the ale says that it debuted at a festival in 1994. Which means that, as of this year, the recipe is old enough to drink itself! The page also says the brew: has an ABV of 7%; has pumpkin, brown sugar, and other spices; and contains flavors (among those of its ingredients) of caramel and malt. Punkin Ale smells like pumpkin. It's more of a vegetabley pumpkinness than a sweet, pumpkin pieness. However, the brown sugar is present in the scent, but not enough to make it sweet-smelling. It's aroma also contains a certain smokiness that I cannot attribute to any of the ale's ingredients. 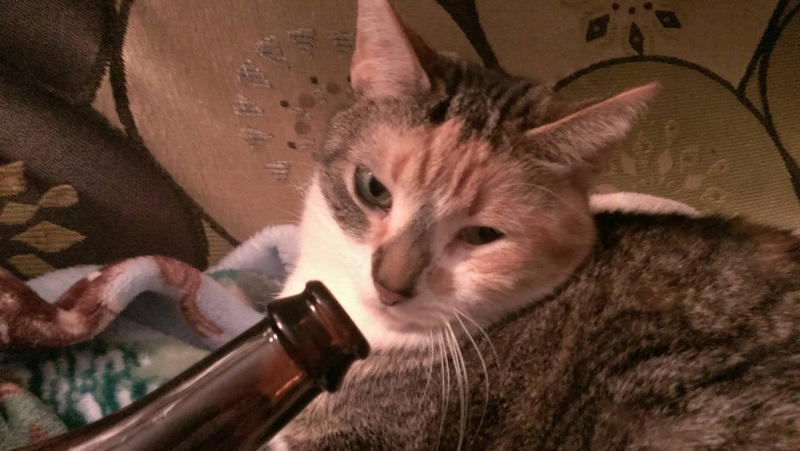 Maybe Purrl doesn't like the smokiness because, although she relishes the scent of pumpkin, she was done with the beer after to quick whiffs. The vegetabliness of the pumpkin is the most prominent flavor in the ale. The brown sugar is there, as is the malty caramel, but this is a pumpkin ale the puts the pumpkin first and foremost. There's a bit of that traditional pumpkin pie flavor lingering around in the aftertaste and it serves to entice me into going back for another swig. This is a good, hearty-tasting ale. As far as mouthfeel goes, Punkin Ale has it! Seriously though, it's a perfect balance of hefty and light, thick and thin. There's carbonation but also a slight creaminess. If you're not careful, it'll go down as smooth as a lager. But, if you want, you can savor each swig without getting bored of holding it in your mouth as you suss out all the beer's nuances. It's funny that I mentioned cabining last week, because Punkin immediately makes me think of the cabining trip my fiancee and I went on this year. We made the (relatively-short-yet-long-to-us) trek from Cincinnati to Lake Hope State Park in Ohio's Zaleski State Forest, where we holed ourselves up for two nights. On the first night we had a store-bought pizza that we baked in the oven. On the second night, however, we made a butternut squash soup from scratch (the emphasis is added because this is a big deal to me). The soup was great. It was vegetabley and filling. 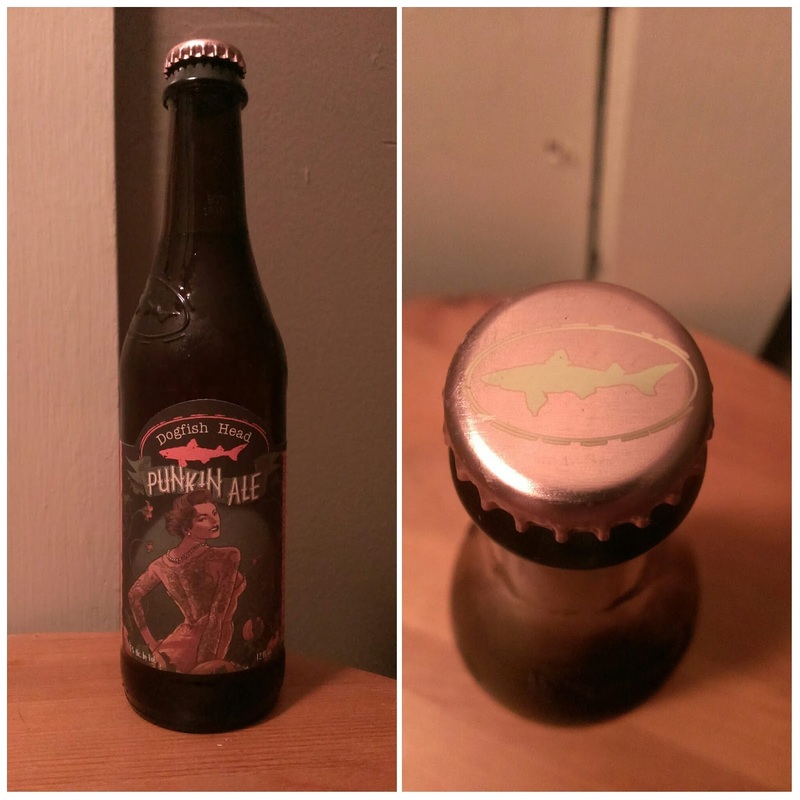 Kind of like Dogfish Head's Punkin Ale, which, by the way, totally lives up to my friend's recommendation. I give it a rock solid 10/10. This is, without a shred of doubt, my favorite pumpkin ale. I have a hunch that this will go great with Thanksgiving dinner, so buy some next year to consume in tandem with your turkey.